In spite of NPR's magical map of Central America, they do know where Honduras is - and, like Lanny cha-ching Davis, they certainly know how to spread all the coup government's talking points. The report on Wednesday's ATC was purportedly meant to illustrate the economic toll that sanctions against the coup regime are having in Honduras, but after a cursory look at that, NPR's Jason Beaubien features a glowing assessment of the coup president and claims, contrary to fact, that the failure to resolve the crisis in Honduras is the fault of both the coup government and the ousted Zelaya government. "The de facto president, Roberto Micheletti, is a big, feisty, grandfather of a man with a crushing handshake." 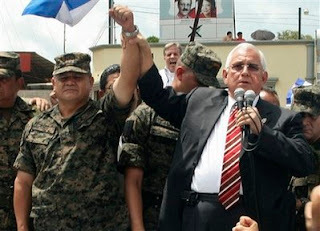 "Micheletti insists that this was not a coup because Zelaya had violated the constitution. Micheletti was next in line to the presidency and he was quickly sworn into office. He says Zelaya was being controlled by Venezuelan President Hugo Chavez, who was plotting to impose a communist dictatorship in Honduras." "The Zelaya people, they are our brother, our sisters, you know. We love them. But we're going to let them to rule this country because they believe in communist and we are not. We are democratic people and we're going to sustain our democracy." "...the Zelaya and the Micheletti camps. Two groups that appear unable to reach common ground....in every social conflict, eventually the parties come to a point where they sit down and work out their differences. The problem in Honduras...the parties aren't yet ready to do that." This last claim is simply a lie, since the Zelaya camp agreed to the proposals for resolving the conflict as set out by Arias over the summer. Something NPR conveniently failed to report on back when it happened. Beaubien's piece may be a mish-mash of distortions and outright lies, but he can take consolation in the fact that Grandpa will be very proud of him. But we're going to let them to rule this country because they believe in communist and we are not. This reads like self-parody, or perhaps something out of Woody Allen's "Bananas." "We want to be free, like the birds in the trees!" I'm sure he would have said that about Fidel Castro when he seized power as well. Recently, NPR's "news' reporting has gone from the ridiculous to the silly to the absurd. Must be CEO Vivian Schiller's influence. And I thought "Voice of the Amerika" Kevin Klose was bad. Speaking of Woody's 'Bananas', I wouldn't be surprised if NPR will still be impressed with feisty Gramps when he orders the national language to be changed to Swedish. Seems the great google in the sky has scuttled my official status. They said I had to verify my ID by leaving a cell number to which they could send a special validation number. I don't have a cell, but my daughter does - and then the validation code didn't work...twice. Not that I care much for official status, it just seems a tad more polite than anonymous. Maybe it's the satanic verses than put me out to pasture. How about another suppliant couplet for the cloying confectionaries in the crowd? We've got to get Stephen Sondheim on the phone! Your lyrics would make a terrific new Broadway show! Good Day!!! nprcheck.blogspot.com is one of the most excellent innovative websites of its kind. I enjoy reading it every day. All the best. If you want an alternative to NPR, consider supporting DEMOCRACY NOW! I've dropped my yearly membership to my local NPR station and have started giving monthly to DemocracyNow! Click on the red text to get started. My name is Matthew Murrey and I'm from Florida, but have been living in the Midwest since 1984. I started this blog because no one else was blogging NPR's drift toward the right - and it made more sense than yelling at the radio. TO EMAIL ME, CLICK ON THE "VIEW MY COMPLETE PROFILE" LINK BELOW AND YOU'LL FIND MY EMAIL. "I've said it before, and I will reiterate it. NPR is a mainstream news outlet." "Q Tips" is an open thread post where you can place general comments or brief notes about NPR. I make every effort not to interfere with comments - BUT I will generally delete violent, gratuitously vulgar, or obscene posts. I realize it can be a subjective judgment call. Even when you're really angry, try to play nice.